The large image here shows an optical view, with the Digitized Sky Survey, of the Andromeda Galaxy, otherwise known as M31. 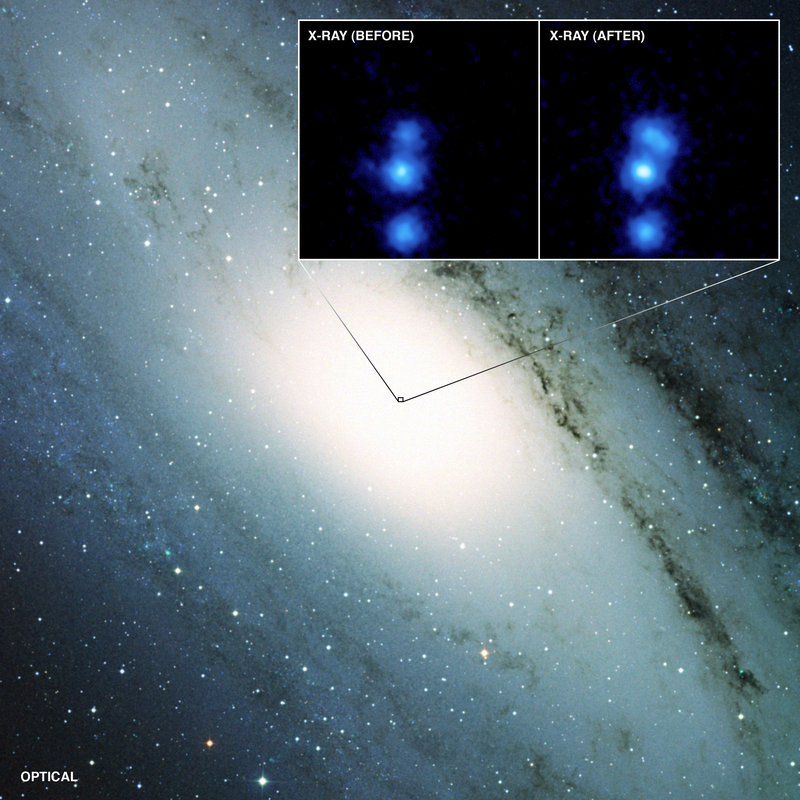 The inset shows Chandra X-ray Observatory images of a small region in the center of Andromeda. The image on the left shows the sum of 23 images taken with Chandra's High Resolution Camera (HRC) before January 2006 and the image on the right shows the sum of 17 HRC images taken after January 2006. 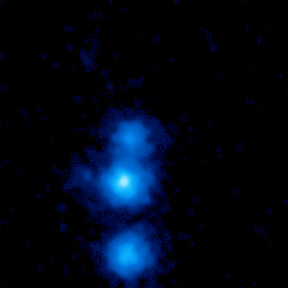 Before 2006, three X-ray sources are clearly visible in the Chandra image, including one faint source close to the center of the image. After 2006, a fourth source, called M31*, appears just below and to the right of the central source, produced by material falling onto the supermassive black hole in M31. A detailed study of Chandra observations over ten years shows that M31* was in a very dim, or quiet, state from 1999 to the beginning of 2006. However, on January 6, 2006, the black hole became more than a hundred times brighter, suggesting an outburst of X-rays. This was the first time such an event had been seen from a supermassive black hole in the nearby, local universe. After the outburst, M31* entered another relatively dim state, but was almost ten times brighter on average than before 2006. The outburst suggests a relatively high rate of matter falling onto M31* followed by a smaller, but still significant rate. Just like the supermassive black hole in the center of the Milky Way, M31* is surprisingly quiet. In fact, Andromeda's black hole is ten to one hundred thousand times fainter in X-ray light that astronomers might expect given the reservoir of gas around it. The black holes in both Andromeda and the Milky Way provide special laboratories to study the dimmest type of accretion ever seen onto a supermassive black hole. Scale Optical image is 1 degree across; inset image is 8 arcsec across. Are there IR pictures of this area taken at the same time? These are wonderful snaps. I'm actually working on one of my project in my institute "United World" on the role of private-public partnership in research field. I'm going to use these snaps to highlight how much progress we can make if we can both private and public resources work together. I often wonder as to where will this Universe end and whether mankind will ever be able to travel in the Universe with such a vast distances. What is there beyond this Universe and what is the end of after that and finally where does every thing end. I like Chandra's site the best as I see all those heavenly bodies which I could have never seen it in my life time. Chandra have really revolutionized Astronomy. Many bodies I still do not comprehend properly but at least I watch them and I am very very happy to know about them. We are really thankful to Chandra Ob. Another great useful observation. It shows just how rapid changes can be. M31 is a name of the galaxy -name M31- for the 4th additional source would suggest to me it is a separate galaxy. The author suggests the source is due to �material falling onto black hole in M31�. Since material in space is concentrated in �interstellar clouds� it does not seem too surprising if the intensity changes, reflecting movement of the black hole from an area of lower density to a more dense �cloud�. This information is so interesting. I am going to start studying so that I will better understand Chandra.